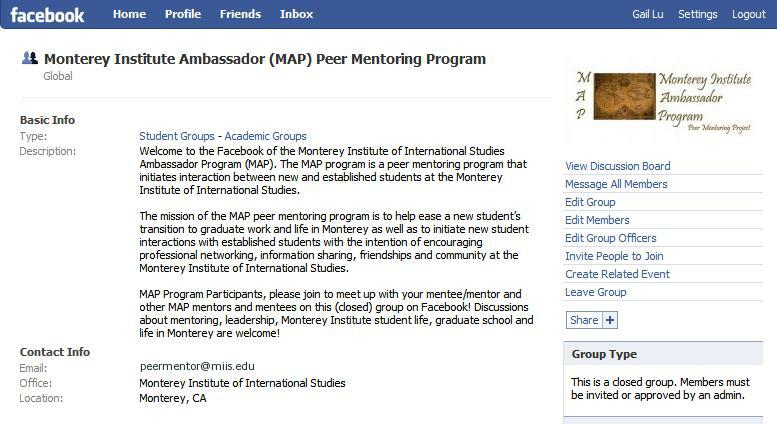 As requested at the MAP Brown Bag Lunch Meeting yesterday, we now have a MAP Program Facebook! 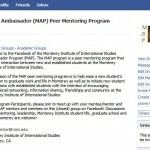 Please join to meet up with your mentor/mentee and other MAP program participants. Discussions about mentoring, leadership, Monterey Institute student life, graduate school and life in Monterey are welcome! Right now it is a closed group for only MAP participants. Please send a request to join and as the administrator of the group I will add you as soon as possible. If you have any questions, please let me know. Hope to see you soon on Facebook!